I see a day when ventricular fibrillation caused by electrical shock will be a thing of the past and fires caused by electrical faults will no longer be a statistic. Until that day comes with electricity, we treat electrical installations like your lives depended on it. Here is a list with definitions of the five hazards of electricity that you and your business or family should know about. Shock is a very small amount of current that can cause your heart ventricular fibrillation. This GFCI receptacle will protect you from the lethal exposure wherever you are. Electrocution generally means an accidental death. 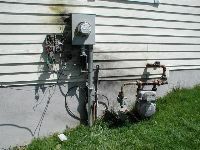 The thermo effects of this loose connection melted the insulation off the wires causing two of the conductors to touch which tripped the breaker and shut down a local restaurant for several days while repairs were being made. Overcurrent is the condition where excessive heat can damage the wire insulation. An overcurrent protection device (fuse/circuit breaker) protects the wire. The fuses above were 4 times too large for this wire. A fault is any abnormal flow of electric current. It may be sudden in the case with the electrical worker or develop over time as in the picture below. 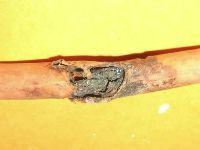 A staple was installed incorrectly penetrating the outer jacket of the cable and through the wire insulation allowing the hot (black) wire and ground wire to conduct via moisture. Over voltage is when the voltage in a circuit or part of it is raised above its upper design limit and components burn-up. This is usually caused by lightning.